Katie Hahn was just a normal little girl. She loved hanging out with her friends and going to dance and cheer practices. Watching Disney channel all day long and her eating family dinner together almost every night was common. She had just started kindergarten at Reeder Elementary. Day by day, Hahn would go on without any worries. That all changed in December of 2009. This normal girl’s world was changed forever. Hahn has struggled through life since then. She has spent many days in the hospital, hoping that she will be okay. Her daily life became a lot more challenging. She is at risk for blindness, amputations, and even death. When she was younger, she had to do around four to six shots and finger pricks a day. Katie and her family’s lives were changed so much. They had to adjust to a new normal. At just 5 years old, Hahn was diagnosed with a disease that would change her life forever. Type one diabetes is an autoimmune disease that is caused by the inability of the pancreas to produce insulin, which is used to move the glucose into the cells for energy. Hahn started showing symptoms in late 2009. She was eating and drinking more than usual. That led to using the bathroom more often. Hahn was losing weight very fast. She would get terrible headaches and stomachaches almost daily. Hahn would be tired all the time, even when she hadn’t done anything all day. Also, horrible leg pain was very common daily. One night, her parents were picking up her and her sisters from her grandparents house. Hahn had just eaten dinner and dessert, but she was still starving on their way home. This wasn’t normal and it happened a few more times after that. This caused the family to think something was wrong. On December 22nd, 2009, Hahn’s mom took her to the doctor to try to find out what was going on with her. The doctor tested her blood sugar levels with a finger prick, and the number was 298. A normal person’s blood sugar level is in the 100s, so this was already a red flag. She was diagnosed with type one diabetes. She was then transported to the hospital, where she stayed until Christmas Eve. Hahn and her mom spent those hospital days learning how to take care of this disease. Type one may have been a major setback, but it never stopped Hahn from living a normal life. “It has made some things hard for me, such as, hanging out with friends, not being able to have sleepovers, and sitting out of cheer practices, but mostly, I live like a normal kid,” Hahn said. Everyday, Hahn has to check her blood sugar throughout the whole day, and gives herself an amount of insulin accordingly. She can get high blood sugar, which is when there is too much sugar in her blood. Diabetics can also get low blood sugar, which is when there isn’t enough sugar in the blood. Both of these are life-threatening, but low blood sugar is more-so. If she didn’t check her blood sugar daily, then chances are she wouldn’t be with us today. Hahn’s mom is in awe with how well she handles her disease. Dealing with this daily has become part of a routine for Hahn, but this is still a disease with many ups and downs. Many parts of the day, Hahn would have to be dismissed from kindergarten to check her blood sugar. This made her miss important lessons at school. Now, she has better technology that can check it for her, while she’s in class. Whenever Hahn is low, she can’t participate in tests, gym class, or cheer practices, which also puts her behind. When she was younger, Hahn didn’t take good care of her blood sugar. When this happened she would have to go to the hospital almost monthly for life-threatening migraines, and she would have to be put on an IV. Diabetes has not only affected Hahn’s life, but her mom’s life as well. Hahn never lets her disease make her fall behind. She is on a Level 5 cheerleading team that could possibly earn a spot at the 2019 World Championships. On her team, she is a flyer, which means she gets thrown through the air, and she can also do many different flips. Hahn also receives high grades at school, and she works really hard on anything that gets thrown her way. Type one doesn’t stop her from anything. 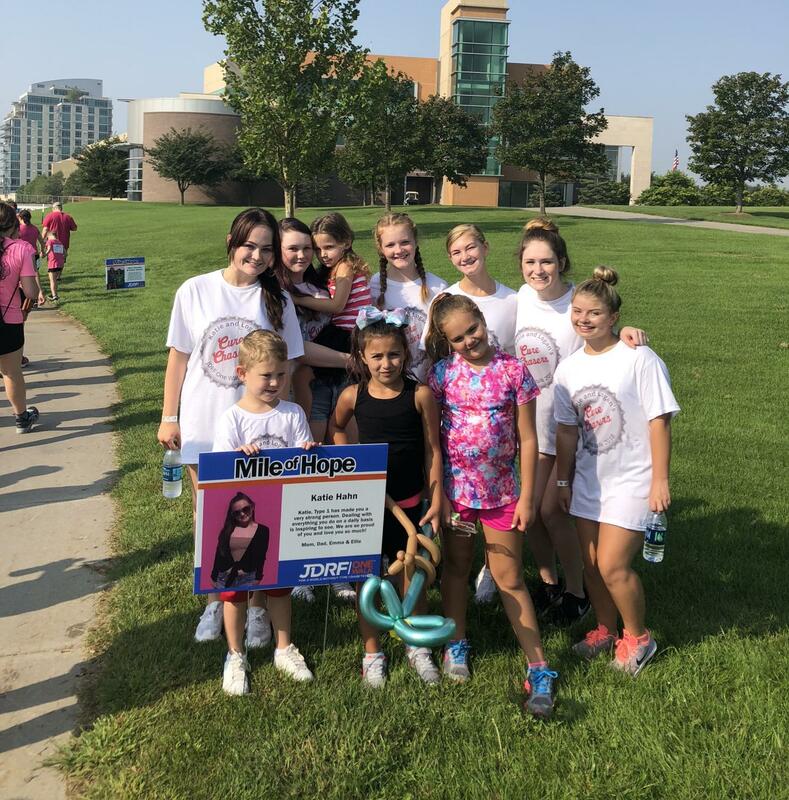 The JDRF walk is one of Hahn’s favorite parts of the year. Her’s family has been participating in the JDRF walk for nine years now. Their team is called Katie and Logan’s Cure Chasers because they walk with their cousin, Logan Hahn, who is also a type one diabetic. Before the walk, each team collects donations through JDRF to give money to researchers for a cure. Team shirts can be made to show support for the walk group. At the walk, there are attractions such as bouncy houses, games, face painting, and more to make the event enjoyable for all ages. All the proceeds from the walk go to the JDRF foundation. It means so much to Hahn that so many people come to an event for her and donate money in order to find a cure to her disease. Though diabetes has made her life harder, it has also opened up many opportunities for her. When Hahn was seven, she entered a JDRF contest to design a car for a NASCAR driver. Her design ended up winning. Her whole family was flown to Detroit, Michigan, for a NASCAR race, where her car she designed would be driven by Trevor Bayne. A person with type one diabetes can either control their disease or let their disease control them. 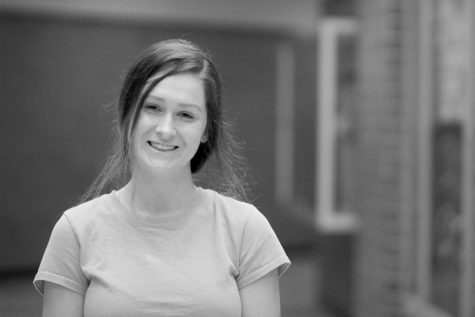 Katie Hahn is controlling her disease, and she doesn’t let it define her in any way. She is still a normal girl. By not letting her disease define her, she has led as normal of a life as she can. Diabetes is a tough and life-threatening disease, but Hahn is a fighter. She will keep fighting until a cure is found.